Hello, and welcome to Impact Day. This is an ongoing, web-based sci-fi story that updates once a week. There’s not a lot you need to know. It’s set in a world that starts off very much like our own. Then, a tear in the fabric of reality (at least that’s what we think happened) brings in a host of trouble. Superhumans, zombifying parasites, gang warfare gone out of control, and military occupation to try and keep it all in check. Our story starts with Sabrina, a young woman only just starting to come to terms with her identity. Suddenly in command of a strange and powerful ability, she’s only just begun to realise how much she’s capable of. Meanwhile, Rachel is on the run from the ex-girlfriend who tried to murder her, and struggling to understand her new-found ability to create. 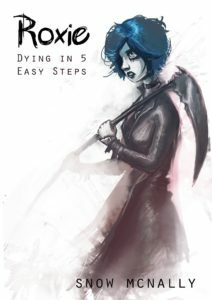 Following Volume 1 is a 5 part interlude featuring Roxie, a reluctant Reaper who would really rather be doing anything else in the world. 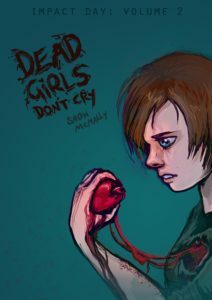 Volume 2 (Dead Girls Don’t Cry) tells the story of the 1 year build up to Impact Day, and how the world turned upside down. Start reading here, subscribe on the sidebar, follow my twitter mouthpiece for updates, and tell your friends. Wanna support Impact Day? 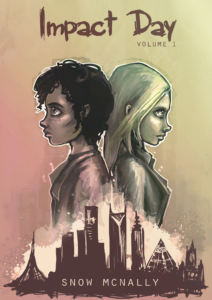 You can become a monthly supporter on Patreon or order the first volume collection here.